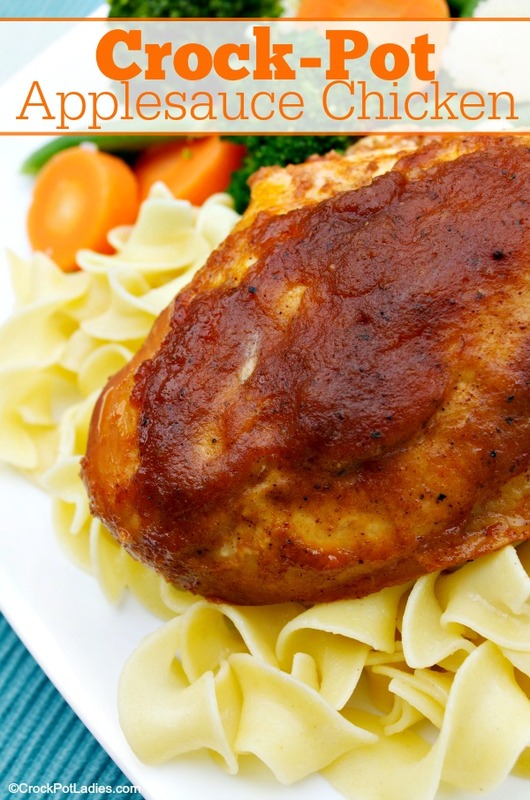 Mix up an easy sauce of applesauce, BBQ sauce, brown sugar and spices and pour it over chicken breasts in this quick and easy recipe for Crock-Pot Applesauce Chicken. Bonus points it can easily be made into a slow cooker freezer meal! Only 4 Weight Watchers SmartPoints per serving! This recipe for Crock-Pot Applesauce Chicken is included in our 10 Easy Crock-Pot Freezer Meals Meal Plan that you can purchase in our store for just $1.99. The meal plan includes 10 great freezer meals that you can prepare ahead of time and have ready to go in your freezer. You will also get a printable grocery shopping list for all the ingredients needed to make all 10 meals as well as printable labels that you can stick on your freezer bags. We love slow cooker freezer meals because they make meal planning so easy on those busy days we all have. But you do not have to make this recipe as a freezer meal if you don’t want to. Just mix up the applesauce sauce (is that redundant?) and pour it over your chicken in the crock! The applesauce sauce adds a nice mildness to the BBQ sauce (use whatever brand you like…we are big fans of Sweet Baby Ray’s brand). The kids really enjoyed this one. 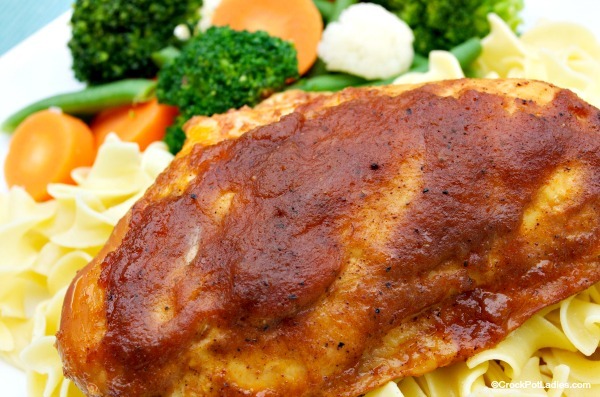 The apple sauce also makes the sauce thicker and it really coats the chicken breasts making for a nice moist chicken. We ate our chicken over some egg noodles (cooked on the stove-top) and I warmed up a bag of frozen summer vegetables as a nice healthy side dish. Just 6 simple ingredients in this yummy and healthy recipe that the whole family will love. See the recipe notes for how to prepare this recipe as a slow cooker freezer meal! Place the chicken breasts in the bottom of the crock. In a small bowl, mix together the remaining ingredients (applesauce, barbecue sauce, brown sugar, black pepper and chili powder) and pour sauce over the top of the chicken. Cover and cook on LOW for 4 to 6 hours or until chicken registers 165° F on a meat thermometer. Place all ingredients except the chicken in a gallon sized zippered freezer bag. Zip bag closed and mush the bag with your hands to mix the sauce up. Open bag and add chicken breasts to the sauce mixture. Lay the bag flat on the counter-top and squeeze out as much excess air as possible before sealing the bag. Label bag with recipe name, ingredients and cooking instructions. Thaw bag overnight in the refrigerator the day before cooking. Dump ingredients from bag into slow cooker and cook according to directions in recipe. What if you are reducing the recipe in half? Does that change the cooking time? You could try reducing the time by maybe 2 hours, but I’d give yourself some leeway in case it still takes the 6 hours..esp if you have an older crock that doesn’t heat up as high as the new ones. Made these a week ago and they were awesome! 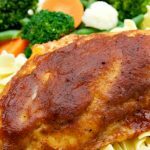 I used chicken tenders and followed recipe exactly, thank you for another wonderful recipe for my collection, your site is now my “go to” place for quick easy slow cooker recipes! I only have applesauce with cinnamon. Will that affect the taste top much? I think it will be OK. It will add a different flavor dimension but will still be tasty! Bone-in thighs should work just fine! After 5 hours on low, the chicken was terribly dry… Any suggestions? I am so sorry that the Crock-Pot Applesauce Chicken recipe did not turn out right for you. I just double checked the recipe and it is 6 hours on LOW which sounds right for the amount of chicken in the recipe. Because there are differences in how individual slow cookers cook we usually give a time range in our recipes so that folks can cook for the shortest time possible and only cook longer if needed. I see that we failed to do that with this recipe and I have gone ahead and edited it to reflect a cooking range of 4 to 6 hours on LOW. If you want to try this recipe again I would try cooking it for 4 hours and checking the chicken to make sure it is cooked through and then, only cooking it longer if it needs it. I really appreciate the feedback on this recipe and I hope you will contact us anytime with your questions or concerns. For the freezer recipe for applesauce chicken, do I put uncooked chicken breast in the freezer bag with all the other ingredients ? To freeze to cook in the future. Yes, the uncooked chicken and the rest of the ingredients all go right in the freezer bag.